Spending time at the airport is not something most of us are comfortable with. Delays, layovers and cancellations cause unpleasant surprises as we think of the airport as a pit stop to our final destination. 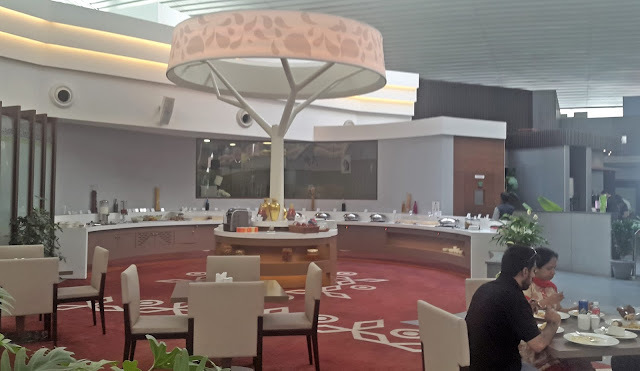 However, after a wicked meal in one of the airlines, I nowadays prefer to drop into one of the nearby cafes or lounges to relax and grab some quick snacks before boarding. One such place to relax at the Bangalore Kempegowda International Airport is the Above Ground Levell Lounge. Invited for a review, this was my first non-travelling visit to the airport. An initiative of the Bird Group, Above Ground Levell Lounge has a simple name which pretty much tells you where the lounge is located. The lounge spans a huge space in the domestic terminal with separate seating areas for the buffet, bar and coffee shop. We sat in the buffet area which was spacious, airy and well lit. Unlike the restaurants in the city, there are a huge number of restrictions for the kitchen as laid down by the airport authorities to enforce security. One of them which quite shocked me was the rule that only plastic knives can be used inside the kitchen premises. While this is a nightmare for any chef, Executive Chef and his crew has adapted to this beautifully and do the processing of meat outside which is then brought in for cooking. They are also forced to use only induction operated stoves which makes some preparations in the kitchens totally obsolete. We started off the buffet with soups and starters. 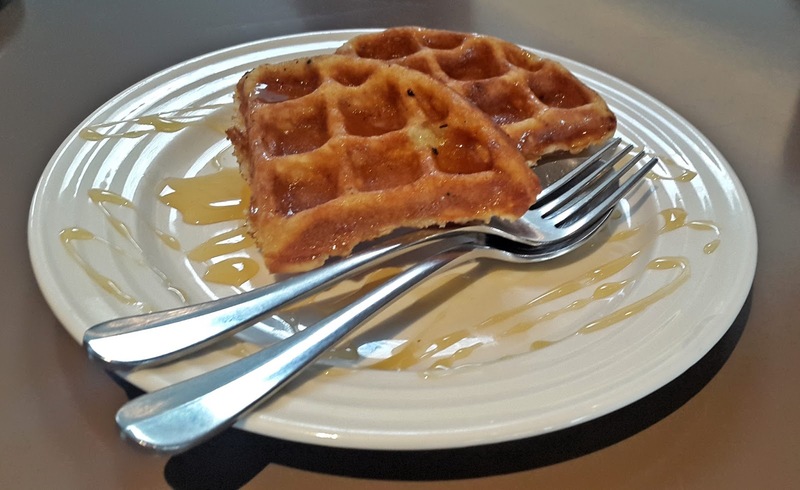 As we were quite famished with the waltzing around in and near the airport, we made short work of them and quickly moved on to the main course. We got to try the Dal Makhani, which is a specialty here and is a regular item in the continuously changing buffet menu. While the dal is not as creamy, it makes up for that with a wonderful achaari taste which makes it a good side with roti. 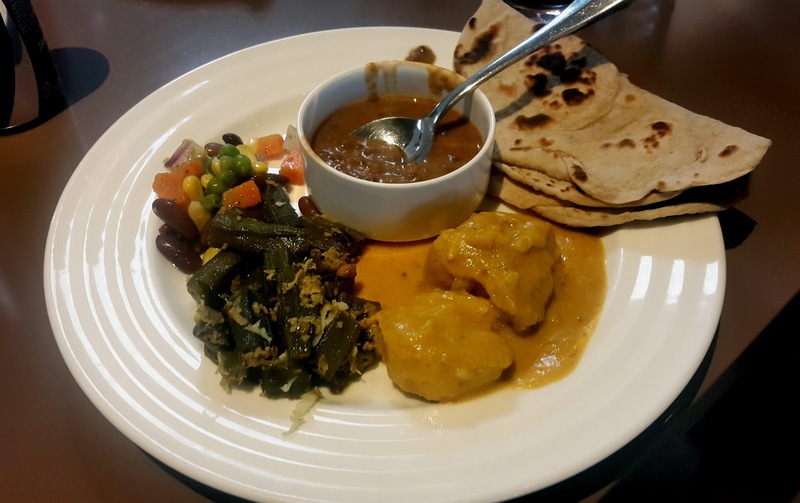 Bhindi Masala and Dahi Chicken were the other notable dishes in the main course. They also have a live chaat and dosa counter beside the buffet spread. 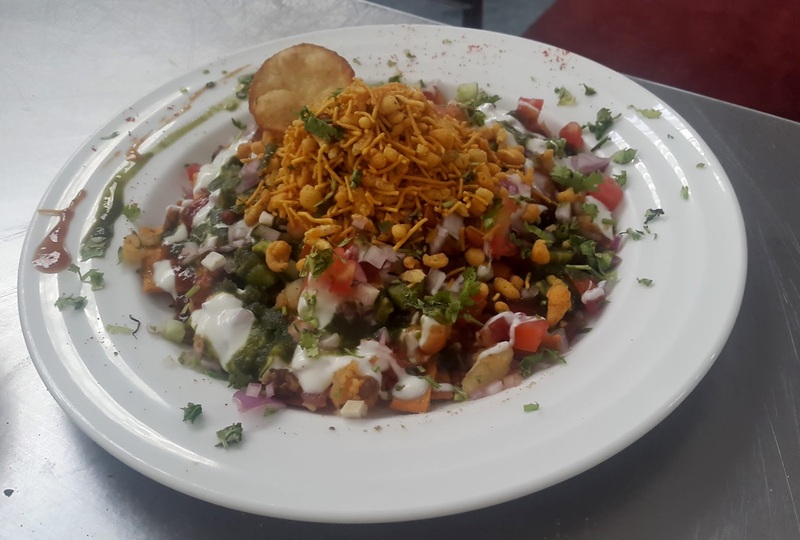 Busy at work, The Chef quickly prepared a bhel puri at our request. 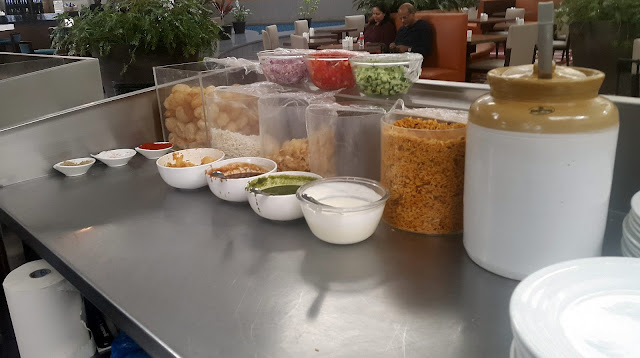 One of the more popular chaats in India, we thoroughly enjoyed the delicious mixture of puffed rice, tomato, sev and the sweet, sour and spicy chutneys. We ended the buffet with some delightful desserts. Sugar sprinkled donuts, fruit cakes, muffins, pudding, waffles; the list of desserts was just endless and they sure make them good. My favourite of the lot was the waffles which was served with honey. The Above Ground Levell Lounge, located at the Bengaluru Kempegowda Airport has outlets at both the domestic terminal as well as the international airport. 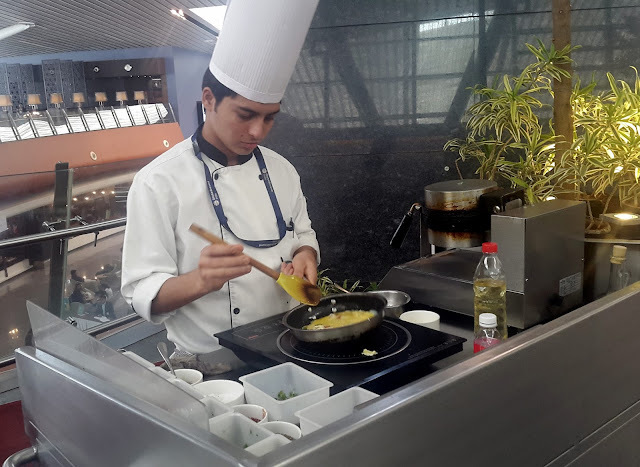 While the management for both are the same, the food is completely different at the two terminals so as to suit the palate of a more international clientele.